How many emails do Email Service Providers (ESPs) like MailChimp, Salesforce (ExactTarget), Oracle (Responsys) and others send? What are the biggest brands using their infrastructure? And do they only send solicited and legally compliant emails? Below you’ll find three data points, which shed some light on these questions. According to its own statement, Cisco’s SenderBase is the world’s largest Email and Web traffic monitoring network. On senderbase.org, you’ll not only find global spam and email volume trends, but also reputation and volume data for sender networks. The latter one is reported on a log scale with a base of 10; in theory, a volume of 10 equates to 100% of the world’s email volume (10^10/10^10 x 100). Likewise, a volume of 7.5 equates to 0.31% (10^7.5/10^10 x 100). Now, having both pieces of information ready, the global email volume and the sender’s percentage, one can estimate the daily email volume of a sender. MailChimp sends 17 billion emails a month for more than 10 million customers around the world. is now sending over 23 billion emails a month, via the cloud, for over 80,000 active customers. PS: Note the terms of service on SenderBase.org. Gmail wants to make email safer for its users. Part of that effort is the Transparency Report for Email encryption in transit. It shows the past and current state of TLS encrypted messages. For example, in the past 30 days, 85% outbound messages from Gmail and 79% inbound messages from other providers to Gmail used TLS encryption. But there’s more to it than that. 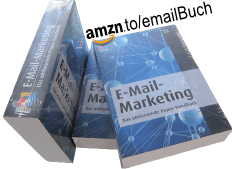 The website also offers a query tool for the top domains in terms of email volume to and from Gmail. Using the tool you see how much of the email exchanged with Gmail for any covered domain is encrypted in transit. The underlying dataset is downloadable as a CSV file. The CSA is an email white list, which is quite popular in the German speaking part of Europe. It is run by the eco Association of the Internet Industry and the DDV (German dialogue marketing association). CSA senders – most of them beeing ESPs – agree to comply with strict legal and technical quality standards. 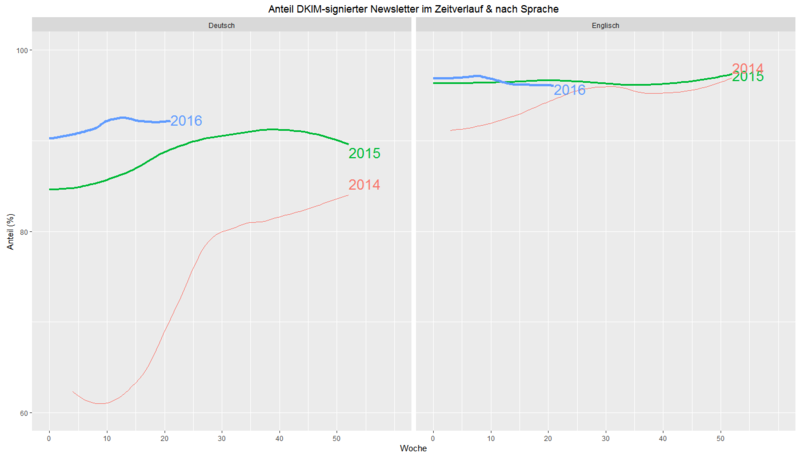 For example, the CSA is responsible for the wide adoption of DKIM authentication since 2014 (see chart & my blogpost on emailmarketing.de). Among the technology partners are big names like AOL, WEB.DE, Yahoo!, Cisco, Cloudmark and Kaspersky. This entry was posted in english and tagged csa, esp. Bookmark the permalink.